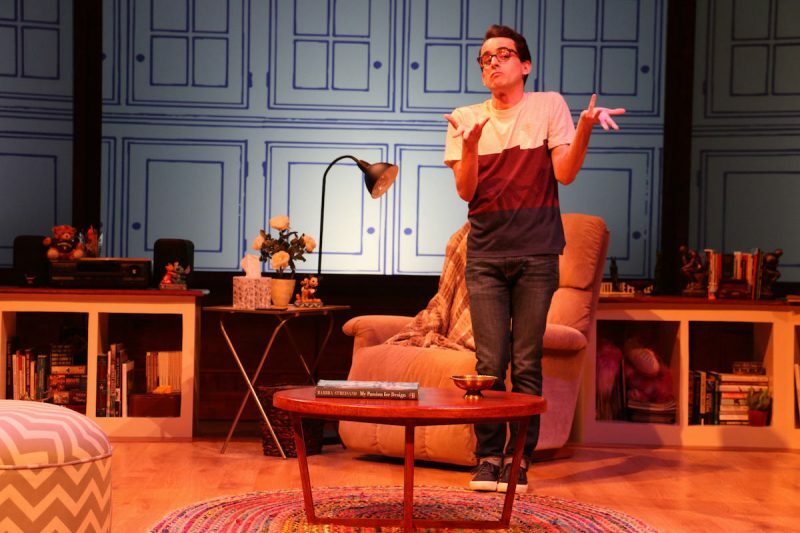 There are more characters on the Waxlax Stage in Jonathan Tolins’ one-man play “Buyer & Cellar” than you might expect. In the hands of actor Remy Germinario, we see a struggling actor named Alex More as he becomes an unlikely cast – from his boyfriend and a supercilious boss to celebrated Hollywood couple James Brolin and his wife, Barbra. If you have to ask “Barbra who?” then perhaps you’ll want to skip this play. But the rest of you should get to Riverside Theatre right away to see something witty and engaging and surprising as can be. Remy Germinario BUYER & CELLAR at Riverside Theatre. And in the play, which is pure fiction, there’s the shop attendant, More. Having lost his job as a costumed character at Disneyland and desperate for employment, he takes the job as cellar shop attendant who spends his hours waiting for the one customer to venture downstairs. Director James Brennan is well served by his scenic designer Richard Crowell who keeps the actor’s living room suitably spare, giving space and imagination to the massive cellar and numerous spaces into which Germinario brings you. Behind, a trio of large screens are the clean backdrop onto which projections of Barbra’s estate, architectural drawings and quirky cameos pop up. The action begins in the dark, with the actor sitting in a comfy chair and listening to Barbra’s recording of “Memories.” He quickly picks up her book “My Passion for Design” which is a self-congratulatory coffee table book about Barbra’s Malibu compound…with photos by Barbra. With Brennan’s adroit direction and Germinario’s stage ease and utter likability, the play zips by. As he interacts with the audience and fights with his boyfriend, you end up feeling as if you have spent nearly two entertaining hours in the actor’s Los Angeles apartment, re-living his astounding gig, the jaw-dropping reality that Barbra has French arcade in her basement and his unexpected relationship with the legend. Especially fun is the sequence in which More fascinates Barbra with his improvised story behind a particular doll. She offers to buy it. Yes, she already actually owns it, but where’s the game in that? More then comes up with an exorbitant price tag and Barbra walks away. It’s the game that catches her eye and results in what he believes is friendship between the two. But is it just that he has entered her self-centered orbit for a while? Is he yet another piece of her collection residing in the cellar? 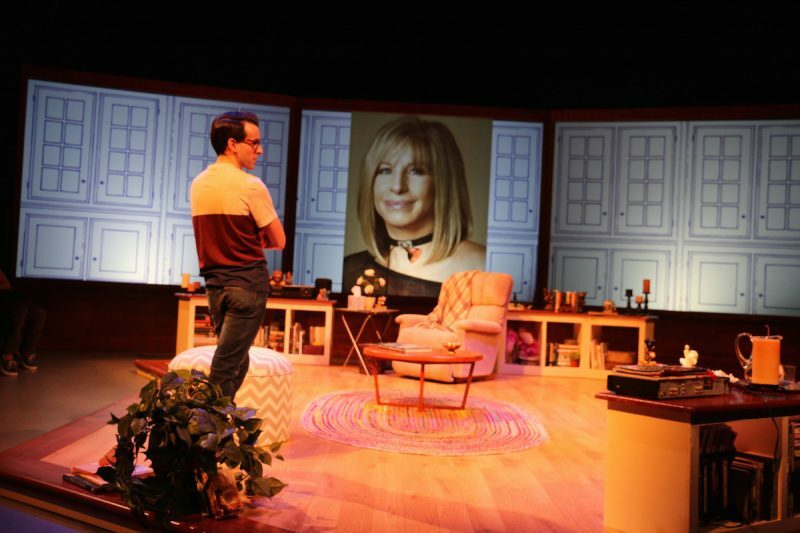 This is a smart, engaging play written with affection and “a passion for Barbra.” Both those who adore the legend and those who deplore the legend, should enjoy this play. SIDE O’ GRITS: “Buyer & Cellar” runs through April 8 on the Waxlax Stage at Riverside Theatre, 3250 Riverside Drive, Vero Beach. Tickets are $55. Call 772-231-6990 or visit RiversideTheatre.com.